Very rugged unit in aluminum case. We made a larger than normal volume purchase of these units to get the best price and pass the savings along to you. So this is a strictly limited time deal. Many features that other testers don't have or if they do just some where this one has them all!!!. Advanced PC software included with bar charts, print capability, USB 2.0 interface, connect to all the options for probe types, C, G, DL etc. 2 year warranty on tester and probe. Impact body is considered a consumable item and its life is dependent material hardness and on amount of use. Membrane keyboard is water proof. Bright LCD display of 128×64 matrix with back-light. Converts to all common hardness scales (HV,HB,HRC,HRB,HRA,HS). Easy and convenient menu operation. Memory of 600 groups of data（impact times:32～1）. Upper and lower limits can be preset. Audible alarm. Print to USB Printer ( not included) automatically with each test or on demand. 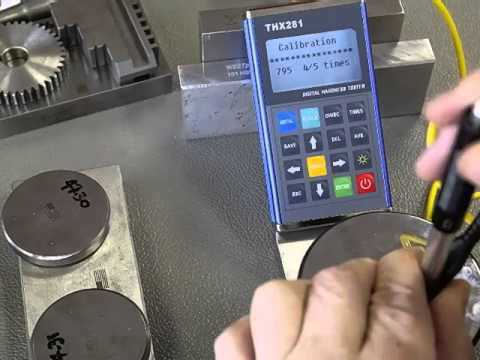 Brief description of the use and a THX271 portable hardness tester. Features and use. Very popular and incredible price.